Join us for this unique women's networking event. Indulge in everything chocolate, all to support Valley Art Center. Bill the Bartender will take you through the journey of a martini while you sip and enjoy chocolate martinis or hot chocolate. The Chocolate Fountain will be flowing so that you can enjoy everything chocolate. Make your own hand dipped take-home treats too! Be a sponsor to everything chocolate. This is a great sponsorship opportunity as we host a chocolate party for our women's networking group. As Your sponsorship benefit you received a free ticket to attend the event, you get to do a two-minute commercial at the event telling the women about your business, you're able to pass out marketing information, logo on the newsletter, logo on the invitation, hyperlinked logo on the website, and you will receive a roster everyone that attends. Enjoying chocolate, sharing your business and supporting a great non-profit... who's in? 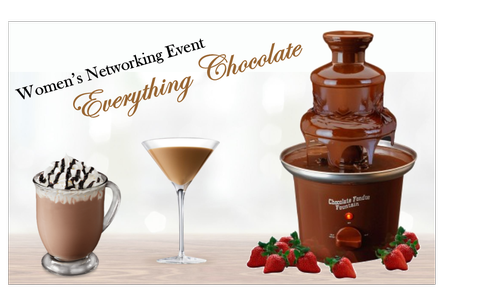 Includes chocolate martinis, chocolate snacks and networking!! Donation (in your name) will be made directly to the Valley Art Center.